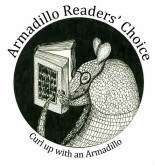 The Armadillo Readers' Choice Award book is chosen by the students in Round Rock I.S.D. Ten to twelve outstanding picture books are nominated by the librarians in the district, and a committee of librarians designs activities to enrich the reading experience for students. Students in kindergarten & first grade are invited to vote for their favorite book each year. Here is a link to the TEKS-based activities that go with each of the nominated books.